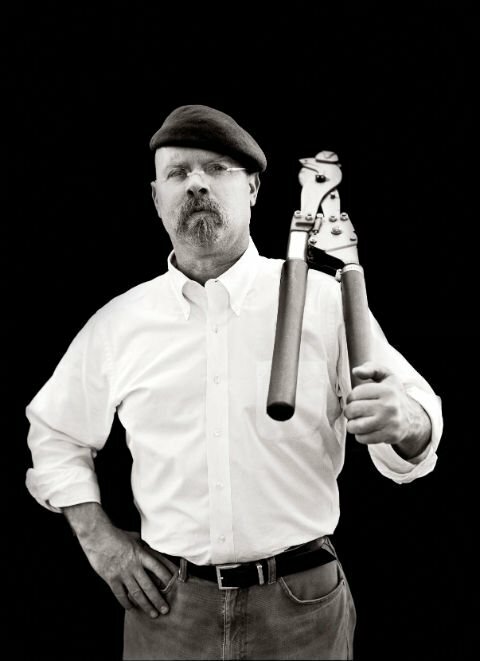 For Jamie Hyneman and Adam Savage, DIY isn’t just for show – it’s a way of life. On a dead-end street in an industrial corner of east San Francisco stands an unremarkable two-storey building. A modest sign identifies the premises as the headquarters of M5 Industries, a special-effects company started in 1994 by Jamie Hyneman – today best known as the star of the Discovery Channel show – and where his co-star Adam Savage was once also employed. Another, smaller sign politely urges sightseers to go away. There are no tours, autograph signings or opportunities to purchase souvenirs inside. Except for spooky robots guarding the stairs, M5’s second-floor offices could be those of any small company, with cluttered desks, a computer room and a small kitchen. Whiteboards are everywhere, crammed with top-of-the-brain doodles, rough technical drawings and the complex logistics of planning the shooting schedule. On this Monday morning, the crew is deep into an episode testing the question of whether golf-ball-like dimples on a car body could reduce aerodynamic drag and improve fuel economy. Compared with crashing two semi trucks head-on (episode 41) or trying to tip over a remote-control city bus (episode 115), today’s challenge might seem straightforward. But Jamie and Adam still have to clear some daunting engineering hurdles – while sticking to the show’s breakneck production schedule. 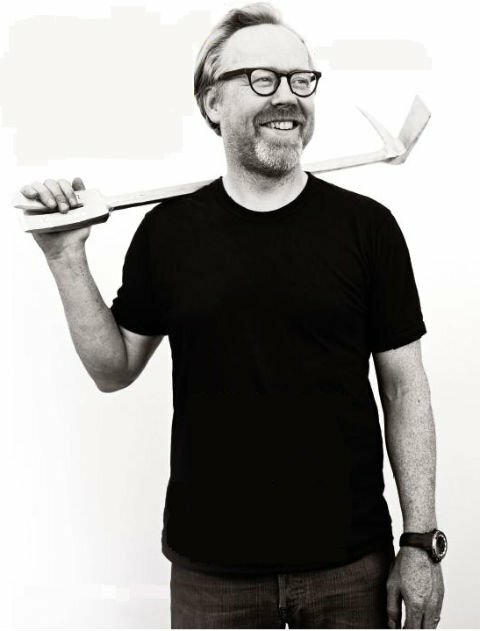 MythBusters attracts nearly two million viewers per episode, making the six-year-old series one of the most enduring hits on cable television. Its two stars have become global celebrities, much in demand for speaking engagements and conferences. So visitors to the workshop may wonder: where is the entourage? Where is the army of shop workers to do the grunt work? A handful of production co-ordinators handle the office telephones, but the usual Hollywood scrum of personal assistants, publicists, cappuccino wranglers and the like is nowhere in evidence. Jamie, it turns out, is already at work in the machine shop downstairs. I find him at a worktable, using callipers to measure the diameter of a bowling ball. He switches to a golf ball, taking measurements that he transfers to a pad, muttering numbers to himself. He and Adam intend to experiment on a real car, but like all good eggheads, they also want laboratory data. They’ve booked time at a nearby Nasa wind tunnel, where their first test will try to establish just how much those dimples really do reduce aerodynamic drag on a golf ball. Unfortunately, they’ve learned that an actual golf ball is too small to produce accurate data. Solution: Jamie has decided to drill dimples into the surface of a bowling ball to create a giant, scaled-up model of a golf ball, one big enough to test in a wind tunnel. Which leads him to the question he is now pondering: just how deep are those dimples in a golf ball, anyway? First, Jamie tries to set ball bearings into the golf-ball depressions. When none fit, he switches to washers and discovers one that’s a perfect match. He scales the tiny washer to a larger one and clamps it to the 16 mm spade bit that he’ll use to drill the dimples in the bowling ball. After tracing the new curve on to the bit, he grinds away extra material – a custom tool in 10 minutes. He hauls out an old bowling ball that the MythBusters shot out of a homemade cannon (episode 118). They sanded the ball to fit in the cannon, so it’s not smooth enough to repurpose – a favourite MythBuster strategy – but it’ll do as a test piece. Using a sheet of thin plastic, Jamie makes a template to mark where the dimples should go and tries a few test depressions. Satisfied with the technique, he yells upstairs to see if his lone intern is back with a fresh ball. Nope. Jamie grimaces. He has 5½ hours to finish the build. Meanwhile, Adam breezes into the wood shop and sets a plastic remote-control model car down on a workbench; trailing behind is Huxley, Adam’s medium-size mutt. Since the Nasa wind tunnel is too small to accommodate a fullsize car, Adam is going to use the toy to make a mould for two model cars – one with dimples, one without. He moves to a table saw and cuts a piece of Trupan, a lightweight fibreboard that he’ll use to fill some of the mould’s casting volume. Huxley doesn’t bark or bolt at the sound of the saw – a real MythBuster dog. In less time than it takes to read this sentence, Adam test-fits the workpiece in the model and adjusts the saw fence three times. He cuts the rest of the pieces so quickly that it seems remarkable he has all his fingers. The south wall is dramatically defined by metal shelves that rise to the 6 m-high ceiling. On those shelves are 600 labelled crates – Foliage, Suits and Booties, Tank Parts. One container, way up high, is labelled Blendo. Tucked inside is the killer robot that started it all. When Adam worked for M5, he and Jamie collaborated on the mischievously named Blendo and entered it twice in an annual San Francisco event called Robot Wars. The now-defunct competition featured robots duelling to the death, the nerd version of a steel-cage match. Blendo’s outer skin is an inverted wok; two opposing blades jut menacingly from the base. The bot spins as it moves; in the ring, it shredded opposing machines, flinging shrapnel into the crowd. In retrospect, Jamie’s first choice for a co-host – Adam – seems surprising. After all, Adam had lasted only a few years at M5. As much as Adam’s speed was a huge asset in the notoriously fast-paced special-effects industry, the two men sometimes butted heads over the mess the Adam whirlwind leaves behind. Jamie is the Spock of the team; logic trumps all with him. He shows little emotion – unlike Adam, who sometimes wears a T-shirt that reads, “I’m the excitable one”. It’s not that Jamie lacks passion; he’s just deadpan about it. A discussion about a favourite project – say, the life-size robots parked under the stairs – can turn into an entertaining and instructive lecture. He built the wheeled bots, which look straight out of a 1950s sci-fi movie, in just three weeks for a GE commercial. Their signature feature is what Jamie calls a superjoint, which simulates an elbow joint. (He’s applied for a patent on the design.) With two cordless electric-drill motors (“one of my favourite powerplants”) mounted in line with the upper arm and hooked to the side gears of a differential gearbox, he designed an arm that functions like the real thing. Spin both motors in the same direction to raise the forearm; reverse one motor to rotate the hand. “It’s twice the power for any movement without adding any weight,” he says. 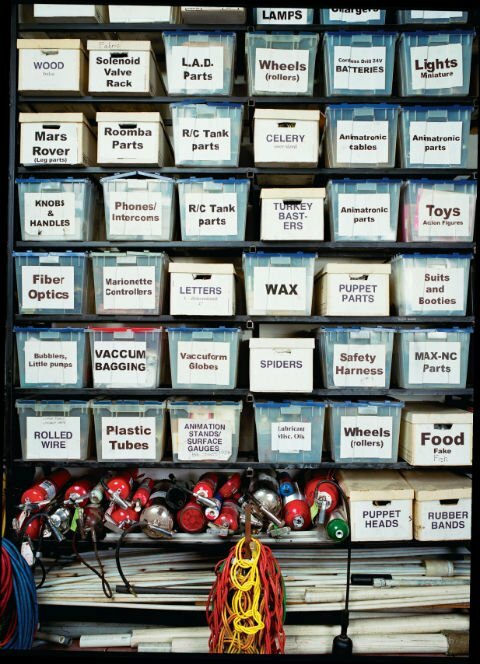 Jamie finds inspiration at swap meets and hardware stores, keeping a “rolling inventory” of material that may prove useful. To solve particularly tough problems, however, he goes into Jamie-land – a metaphorical room of a certain size and shape. He grew up in Indiana, studied Russian linguistics at Indiana University (“it was interesting at the time”), owned a Caribbean dive shop and worked as a boat captain. Although landing in the special-effects industry might seem like the hand of fate, it was planned. 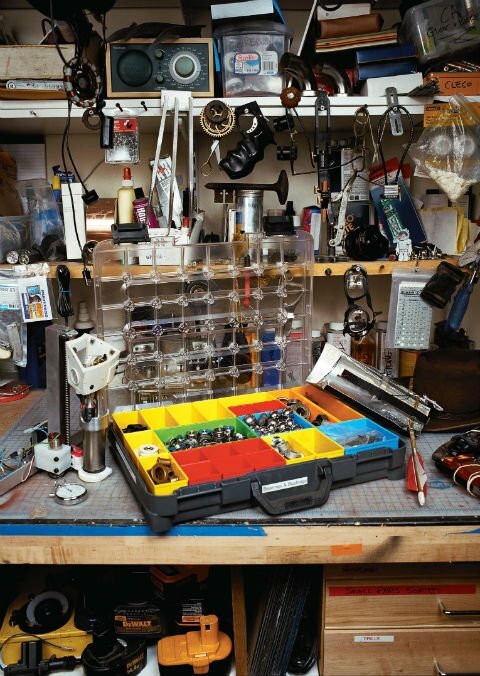 Adam’s home workshop reflects the inspiration he finds in “a certain amount of visual cacophony”. With limited space at his urban address, he jams an alarming number of tools and old props into a 3 x 3,6 m room off an underground, single-car garage. In the suburbs, the space would be a good-sized walk-in cupboard. His off-hours work seems to favour his artistic side, like the King Kong statue he’s painting, but he thinks it’s wrong to separate art from engineering. “Someone who designs a really good carburettor is going through the same process as a painter,” he says. Growing up outside New York City, Adam had free rein with his father’s hardware-store charge account. He worked alongside machinists and welders, picking up skills on the job. He studied drama at New York University, worked with robotic sculptor Chico MacMurtrie, and finally landed in San Francisco’s special-effects community. His reputation for quick problem-solving and construction – “I like screwing it up twice and still doing it better than the guy who did it once” – led to the gig building props for Jamie at M5. After M5, Adam worked at a toy company and then joined Industrial Light & Magic, the special-effects outfit founded by George Lucas. Then came Jamie’s call to join MythBusters. Back at the worktable, with a cameraman filming over his shoulder, Adam coats the inside of the mould with wax and then with a layer of mould-release spray. The delicate model-car mould is the only one available; if Adam damages it, the shoot is over. So he very carefully ensures that every corner is covered. The two-part polyurethane resin generates heat as it reacts, which could distort the mould. He has to make two models with it, so he pours in a small amount of the resin to form an insulating layer. After a few minutes, he puts on a breathing filter and mixes the resin with glass microballoons, a filler material. He pours in the mixture, sets in the Trupan blocks and puts the mould aside. Cut! 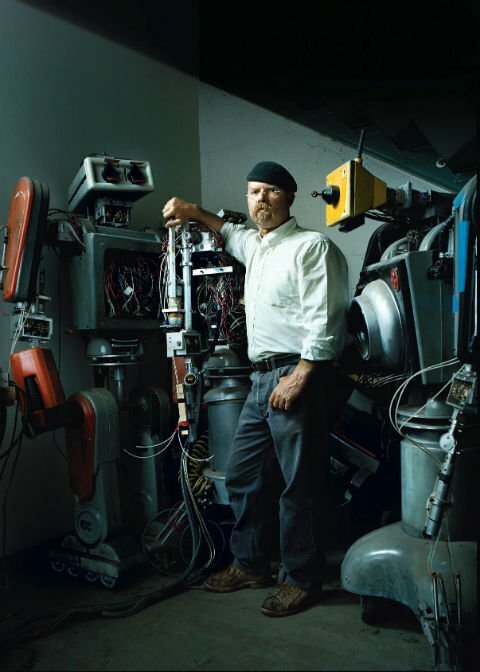 As fun as it is to watch Jamie and Adam produce mechanical oddities, it’s interesting to see how the MythBusters team has reinforced the value of science, engineering and the art of building things. In recent years, science and maths education in American schools has suffered as shifting priorities have reduced opportunities for students to perform hands-on experimentation. The intern has delivered a new bowling ball, so now Jamie is back at the drill press, creating the dimples. It takes almost an hour of drilling the holes to just the right depth and repositioning the 4,5 kg ball, a sequence Jamie performs 321 times without stopping. While it sounds like assembly-line drudgery, Jamie doesn’t mind. “I enjoy the opportunity to turn off my mind,” he says. In fact, I hear him humming. Could it be “Zip-A-Dee- Doo-Dah”? Adam’s demeanour wouldn’t suggest he has the patience for this repetitive work, yet he ploughs right through it. “It’s like cleaning up a room,” he says. “You pick up one thing at a time.” In 45 minutes, he drills 732 dimples. Now it’s 4:30. The only thing left to do is the painting. Jamie sets his ball under the painting booth and goes to work with a spray can, moving slowly, precisely. Adam takes his turn, moving his spraying arm quickly back and forth past one of the model cars. “The trick is to spray past the object you’re painting,” he says. “See? It’s easy.” His hand is a blur. If I could have only one welder, it would be MIG. There are times when you have to use a TIG for high-performance welds and a stick welder for coarse work. But MIG is the easiest, fastest way to weld. And the most versatile – you can use it 90 per cent of the time. This 25 mm tubing makes for easily welded joints and light, stiff structures. They improve the overall workflow. Dust collectors are the difference between a shop that works powerfully and one that limps along. Always have them within easy reach. In our workshop, you’re never more than 5 metres away from an extinguisher. I designed and built these tables to save floor space and increase countertop area in our workshop. The two 25 mmsquare steel tubing frames are the same height, but the foursided inner frame is narrower, so it fits inside the three-sided outer frame. Both tabletops are plywood. The inner top isn’t secured to its frame; when the frames nest, it rests on the outer table’s top, temporarily secured with wood screws. When expanded, most nesting tables have stepped-down surfaces. With my design, when I slide out the inner table and move its top into place, it’s flush with the outer top, doubling the worksurface area. It’s quiet and cuts through steel, aluminium, wood and plastic. I could cook with the thing, I love it so much. I build everything out of 25 mm Trupan. It’s half the weight of typical particleboard and doesn’t have any formaldehyde in it. One of the best tools ever invented. I’ve got about eight – and one for every toolbox. It’s insanely useful to have one with you at all times. Once you start, you won’t be able to do without it. Promise. I bought a bunch of suitcase-size tool sorters and filled them with every nut and bolt I’ll ever need. The cases slide under my workbench, and they’re labelled on the side so I can find everything. And I can fit the cases in the back of my truck. Every off-roader needs a toolkit, but space inside my 1982 diesel Toyota Land Cruiser is tight – and a tailgate- mounted toolbox might attract thieves. So I converted a metal jerrycan commonly found on adventure rigs into an incognito toolbox. On the narrow side, opposite the petrol cap, a piano hinge riveted in place connects the halves of the can; a two-piece metal brace holds the top part open. Aluminium sheets divide the interior space and secure smaller items. To further conceal the can’s true purpose, I made a tailgate mount with steel supports that hide the seam.